Like last year Xiaomi gives the Mi Notebook Air a hardware update, this time even with optical changes! What’s new, what stays the same? We are one of the first to hold and test the new Xiaomi Mi Notebook Air 2018. With the release of the first generation of the Xiaomi Mi Notebook Air, the manufacturer set new standards in laptops from China. At that time, most Jumper or CHUWI notebooks from China were real plastic bombers with partly mediocre workmanship. Xiaomi implemented high-quality aluminum covers, solid workmanship, good battery life and above all the latest hardware right from the start. 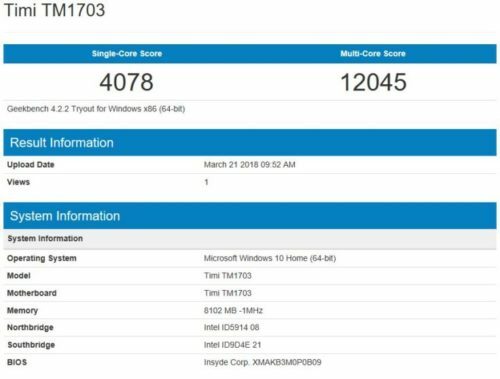 To keep it that way, there was a hardware update for the Xiaomi Mi Notebook Air last year, which included a fingerprint sensor and processors from the Kaby-Lake family (7th Gen Intel processor). In addition to this update, the manufacturer launched another laptop hit in the fourth quarter of last year. The Xiaomi Mi Notebook Pro 15.6″ is delivered with the recently released i5/i7 processors of the Kaby-Lake-Refresh family (8th Gen Intel processor) and optionally 8 GB or 16 GB RAM. Xiaomi Mi Notebook Air 2018 version – what’s new? Now it’s the Xiaomi Mi Notebook Air’s turn again. At least the 13.3 inch version develops in the course of this update to a more compact version of the Xiaomi Mi Notebook Pro! Would you like to have English subtitles on our videos? The packaging of the Xiaomi Mi Noteook Air has changed little over time and over the generations. As usual, it’s simple and based on the design of a MacBook carton. Inside the box, next to the Xiaomi Mi Notebook Air (2018) itself, is a power supply with CN plug, a USB-C charging cable and a Chinese manual. Unfortunately, the accessories are not particularly extensive, but that’s all there was to the predecessor models. The new Xiaomi Mi Notebook Air 2018 with 13.3 inch is in no way inferior to its predecessors in terms of manufacturing quality. The laptop is overall very well processed, there are no material defects, flaws, dents or unevenness. The gap dimensions are also ideal, the individual components of the housing fit together perfectly. 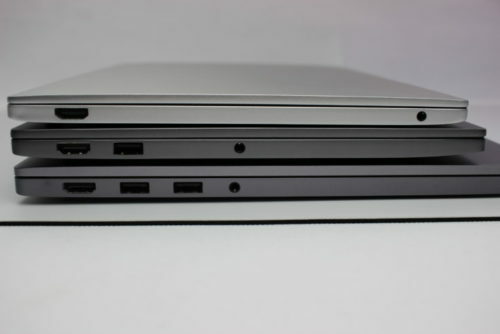 The dimensions of the Xiaomi Mi Notebook Air with 13.3 inch have not changed in the course of the versions. The aluminium body of the new 2018 model also measures 309.6 x 210.9 x 14.8 mm, weighing 1.31 kg. What has changed since this version, however, is the color of the body. While the first two generations of the Xiaomi Mi Notebook Air were available in silver, the new version is available in deep grey. Xiaomi has decided not to keep any colour difference to the Mi Notebook Pro version. 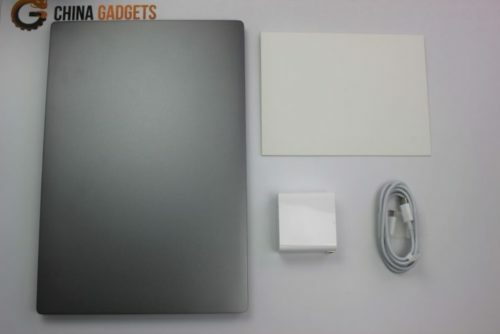 Since all new notebooks of the model with the apple come on the market in dark grey, this step seems only logical. In a direct comparison, however, it is noticeable that the colors do not quite match, in my opinion the Xiaomi Mi Notebook Air 2018 is a little darker than the Xiaomi Mi Notebook Pro. While the keyboard and body of the Xiaomi Mi Notebook Air series were previously the same color, Xiaomi is now also swivelled in the same case color for the keyboard. Like the Xiaomi Mi Notebook Pro, this is now black with white lettering. Xiaomi advertises that the keyboard has been haptically improved compared to the old Xiaomi Noteboook Air keyboard. In the test we compared the keyboard of the Xiaomi Mi Notebook Air 2016 with the new keyboard and actually you notice a small difference here. The new keys shake less and feel less plastic. 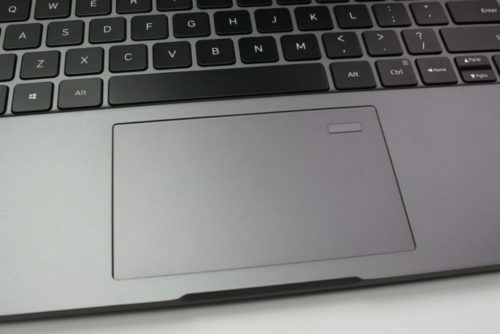 The keyboard illumination is identical to that of the Xiaomi Mi Notebook Pro and unfortunately not dimmable. It can only be switched on or off with the F10 key. All in all, it illuminates the keys evenly – very nice! If you do not use the keyboard, the lighting switches off automatically after 15 seconds. 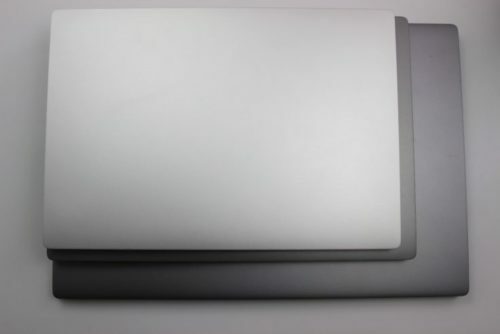 The touchpad of the Xiaomi Mi Notebook Air 2018 is correspondingly smaller in relation to the size of the laptop than the 15.6″ version. In my opinion, the 10.9 x 6.6cm pad is sufficient to maneuver the mouse pointer in all directions. 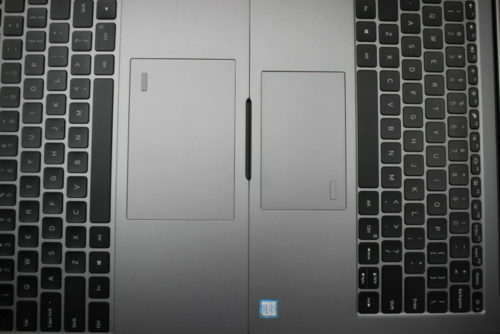 The touchpad of the Xiaomi Mi Notebook Pro measures 13.3 x 9.3 cm in comparison. Multitouch gestures are supported with up to four fingers and can be customized in the Windows settings. 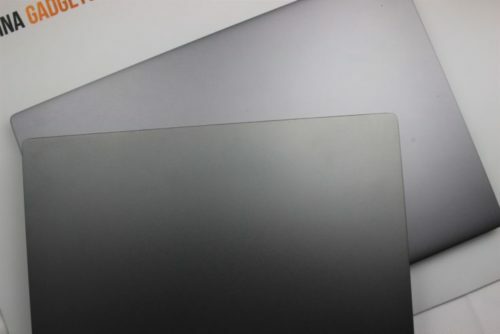 The fingerprint sensor has been retained and is identical to that of the Xiaomi Mi Notebook Pro. He does a good job and unlocks the laptop, very quickly and above all reliably. 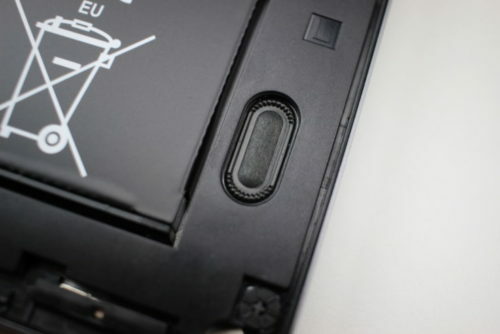 Since the sensor is slightly lower than the touchpad, it can be felt well and does not affect the cursor’s path. 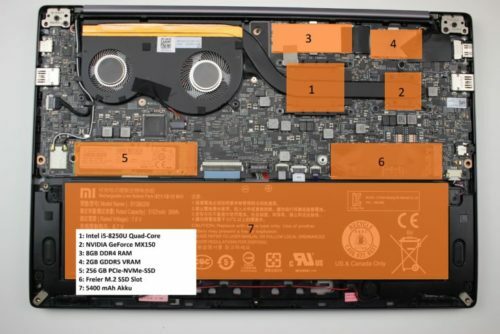 Compared to the predecessors of the Xiaomi Mi Notebook Air 2018, nothing has changed in terms of connections. 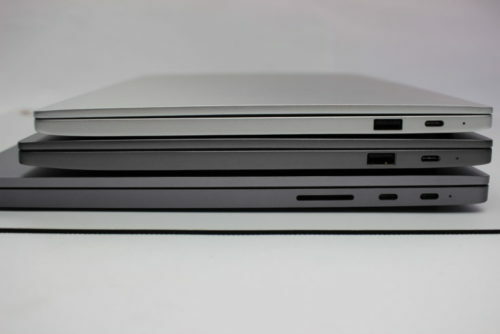 On the right side of the notebook is a USB-A 3.0 port and a USB-C 3.1 charging port with power delivery. The USB-C port can also be used to connect a high-resolution screen or multi-adapter to the laptop. On the left side is another USB-A 3.0 interface, a full HDMI port and a 3.5mm jack input. I myself used the 12.5 inch version shown in the picture every day and even with these very manageable connection options I manage in everyday life. Of course this depends on your personal requirements, so in case of emergency I always have the HooToo USB-C Hub with me, so it’s safe. With the 13.3 inch version, in which an additional USB-A port has been implemented in comparison, it should always be sufficient for normal office work. In addition to the physical connections, there are the wireless connection options Bluetooth 4.1 and WiFi. The built-in WLAN module is a Dual WiFi 2.4GHz/5.0GHz, which supports 802.11 a/b/g/n/ac. The Xiaomi Mi Notebook Air 2018 comes pre-installed with a Chinese Windows 10 Home Edition. This must first be set up when the notebook is started for the first time. Since none of us really speak Chinese, but the setup process of Windows is known, we just click through quickly – at the end we reboot the computer anyway. 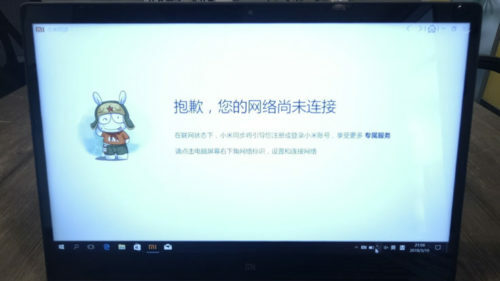 The first boot opens the Xiaomi PC Suite, with which other Xiaomi devices, such as the Xiaomi smartphone, can be paired and synchronized. 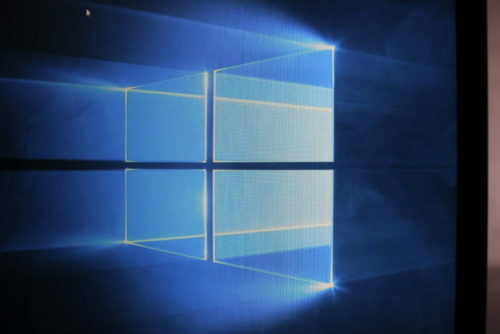 Apart from this program, however, the Windows seems to be as clean as possible. 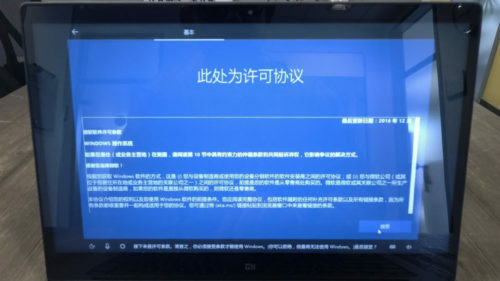 Nevertheless, after reading out the Windows product key, the Chinese version of Windows 10 had to give way to a new installation. 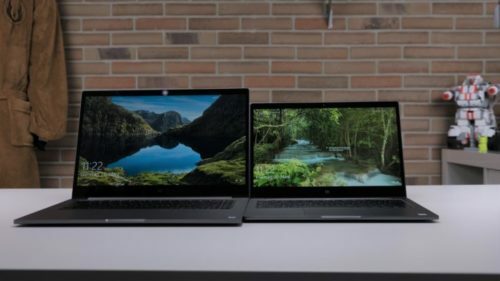 The FULL HD display of the Xiaomi Mi Notebook Air 2018, like the screens of its predecessors, has a resolution of 1920 x 1080 pixels. 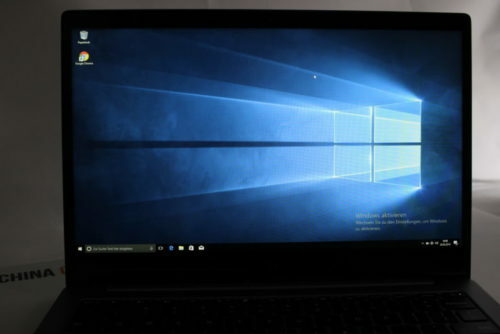 The screen has no pixel errors and is not very different from Xiaomi Mi Notebook Pro or Xiaomi Mi Notebook Air. Already with the Xiaomi Mi Notebook Pro version we would have liked a higher resolution screen. Unfortunately, even with the new Xiaomi Mi Notebook Air 2018, this wish has not been fulfilled and Xiaomi is again using an FHD panel. 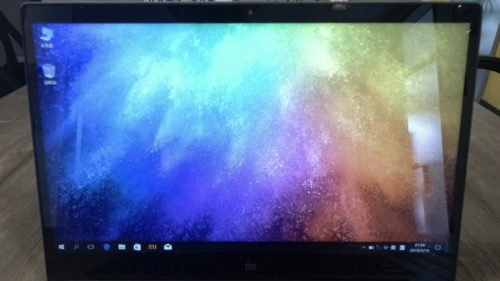 Sure, a full HD screen is certainly enough, but the Xiaomi Mi Notebook Air 2018 lacks the “WOW effect”. A 2K display resolution would certainly have been the right innovation at this point to create such an effect. But now enough grumbling. Compared to the displays, which use CHUWI or jumpers, the displays of the Xiaomi notebooks are still unbeaten in front. The panel provides solid black values and backlight-bleeding effects do not exist. Since the first model of the Xiaomi Mi Air, the manufacturer has significantly improved the hinges used to open and close the laptop. In my opinion, these were even too smooth-running with the first models. Here Xiaomi has now found the right way. 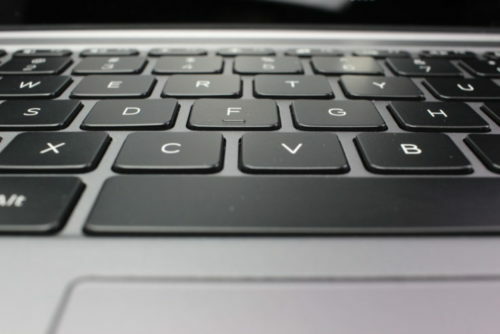 The laptop can be opened with one hand without the underside moving and is still stiff enough to prevent an unwanted change of the angle, for example while carrying. 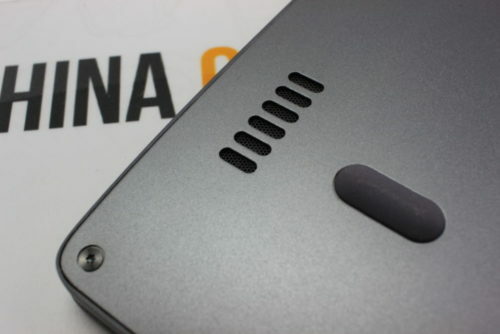 Hardware in Xiaomi Mi Notebook Air – gaming possible? In general, the new Xiaomi Mi Notebook Air 2018 features a smaller Xiaomi Mi Notebook Pro. Only the largest version has twice as much RAM (16GB RAM), but the i7 processor is the same. Our version with Intel i5-8250U Quad-Core@ 1.6-3.4 GHz and 8GB DDR4 RAM is comparable to the smallest version of the Xiaomi Mi Notebook Pro. A 256GB PCIe SSD and an NVIDIA GeForce MX150 with 2GB GDDR5 VRAM are also used in both computers. The built-in Intel i5-8250U belongs to the current, 8th processor generation “Kaby-Lake-Refresh” from Intel and is thus the latest that the manufacturer has to offer in the area of notebook processors. 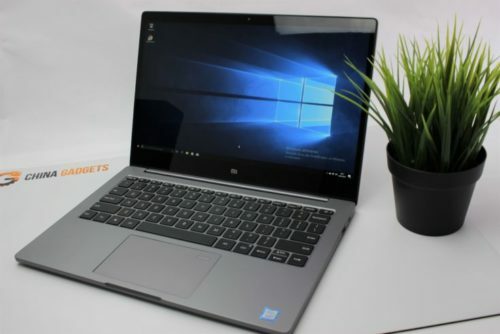 The i7-8550U, which is used in the more powerful version of the Xiaomi Mi Notebook Air 2018, also belongs to this generation. 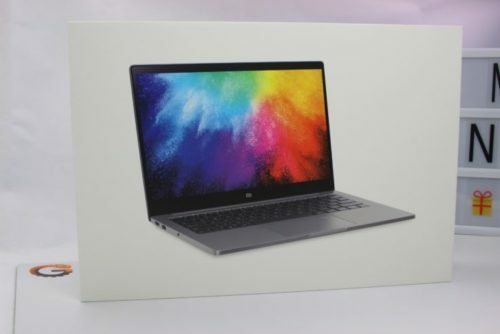 Regarding the graphics card there is no innovation, already with the 2017 version of the Xiaomi Mi Notebook Air 13.3″ Xiaomi used the GeForce MX 150 with 2 GB GDDR5 VRAM. The laptop graphics card is comparable to a GeForce GTX 1030 and is therefore more of a beginner graphics card. It is nevertheless better than the on-board graphics chip “Intel Graphics UHD 620”, which is also available. The built-in hardware is still suitable for games, Diablo III or Overwatch can be played with medium graphics settings. However, current blockbusters are rather not for the laptop, unless you can come to terms with very low settings. 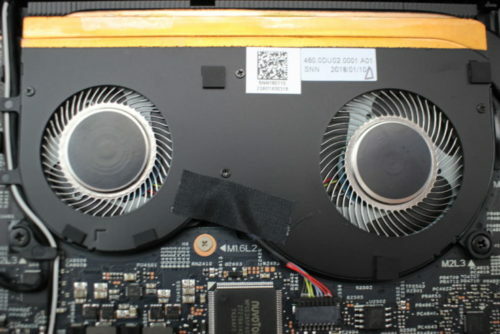 The fan technology has been optimised under the hood. While the fan wheels of the Xiaomi Mi Notebook Pro are still made of plastic, the fins of the Xiaomi Mi Notebook Air 2018 are made of metal and thus much more durable. They also grew 36% compared to the Xiaomi Mi Notebook Air 2017. This has improved the cooling performance and the maximum performance can be called up over a longer period of time. 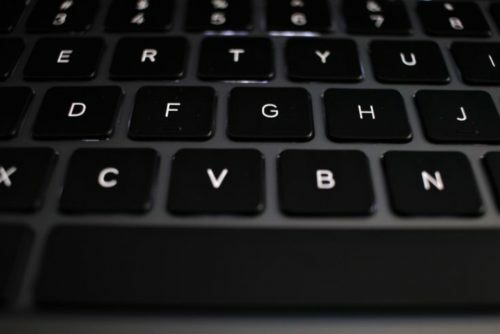 Warm air is output through slots between keyboard and screen, similar to MacBook. Unfortunately, the air is still drawn in via the underside, so the attraction of dust remains unavoidable. As with the predecessor models, the fans are not active throughout, but are only switched on as required. 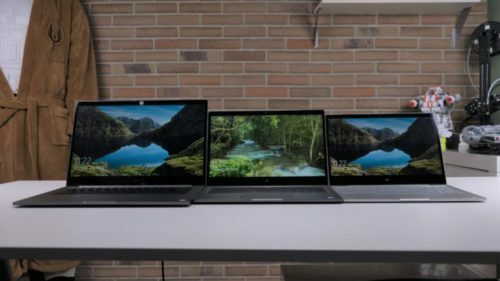 Although the Xiaomi Mi Notebook Air has similar components as the big brother, the benchmark tests turned out slightly worse. This could be due to the more compact mainboard or the other cooling system, for example. 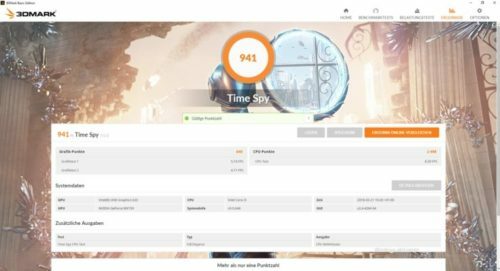 The Xiaomi Mi Notebook Air 2018 achieves a score of 941 in 3DMark. 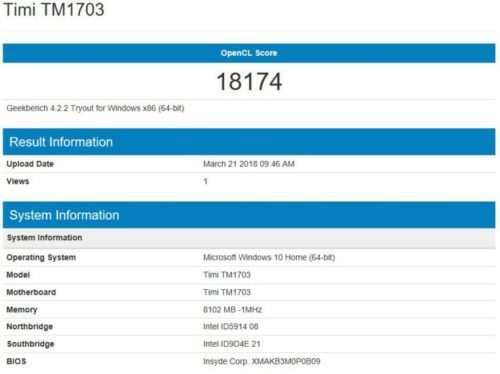 The geekbench 4 benchmark tests were also slightly worse. In the CPU test, a value of 4078 was achieved in single-core and a score of 12045 in multi-core. 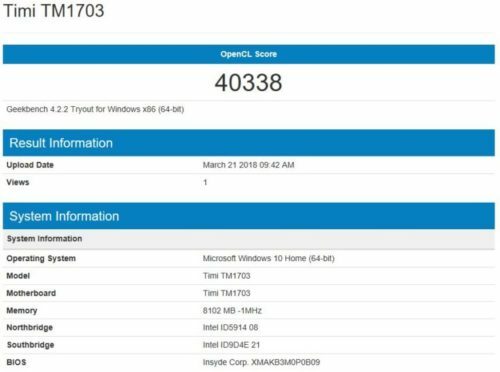 Here the Xiaomi Mi Notebook Pro reached 4078 and 13901 respectively. As already mentioned, the built-in GeForce MX150 is more of a low-cost graphics card with manageable performance. Compared to Intel on-board graphics chips, however, there is already a big difference. This is also reflected in the benchmark tests. In the Geekbench 4 graphics test, the GeForce MX150 achieved a score twice as high as the Intel UHD 620 on-board GPU. Test: How long does the battery of the Xiaomi Mi Notebook Air 2018 last? Xiaomi indicates the battery capacity of the laptop with 5400 mAh, so nothing has changed compared to the predecessor. 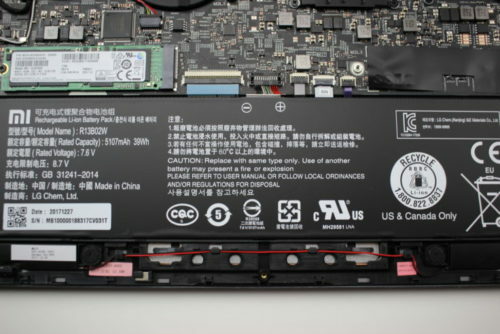 On the battery itself, however, there is only talk of 5107 mAh. It is a pity that the battery cannot be unplugged “just for a moment” during mains operation. With normal use, surfing, simple office applications and about 50% brightness, the battery will last about 7-8 hours. With maximum performance settings stream video or gaming, the battery runs out much faster, so it ends after about 4 hours. Overall, the battery performance is solid, especially the “only” FULL HD resolution screen does the battery life good. Thanks to the fast 1C Quickcharge, the battery is already 50% charged after only 30 minutes charging time. The entire charging process takes about 1.5 hours with the original power supply. With the new version of the Xiaomi Mi Notebook Air 2018, the Air series takes over the 65 Watt power supply of the Xiaomi Mi Notebook Pro. The CN connector contacts of the power supply can be folded in very conveniently – so it can be stored more compactly than other power supply units. If you prefer to use a power supply with another plug, you will find a range of compatible USB-C power supplies on the Internet. While the Xiaomi Mi Notebook Pro uses speakers from Infinity by Harman, AKG traditionally remains audio partner for the Xiaomi Mi Notebook Air series. 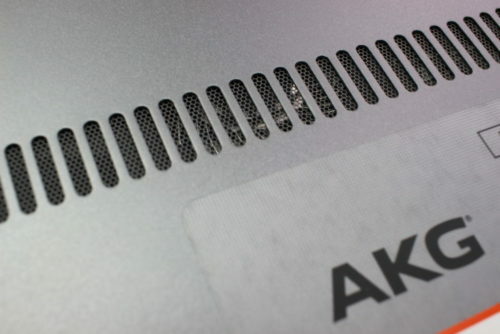 Optically, the AKG speakers inside the Xiaomi Mi Notebook Air 2018 are probably the same as in the previous model. The speakers use both the cabinet and the laptop as sound amplifiers. The sound is audibly better when the laptop stands on a table or similarly firm surface, on the lap the sound is correspondingly worse. Compared to its predecessor, the sound quality is equal to that of a MacBook 2017. Compared to other laptops from China, the sound is unbeatably good, because they like to save money at this point. While you don’t want to listen to a budget notebook from CHUWI, Teclast or Jumper after only 5 minutes, I could imagine watching a whole film with the Xiaomi Air loudspeakers from AKG. Conclusion – is the Xiaomi Mi Notebook Air 2018 with 13.3 inch worth it? That Xiaomi builds solid notebooks is no longer a secret, with the Xiaomi Mi Notebook Air 2018 with 13.3 inches the manufacturer brought the logical further development of the previous year’s version onto the market. The most exciting innovations are the new look, in Xiaomi Mi Notebook Pro or MacBook style, and the new processor generation, with which quad-core processors are now available in Notebook Air for the first time. However, the large “WOW effect”, as with the Xiaomi short-distance beamer, for example, did not occur. Somehow you’ve seen everything before. It’s a bit like Apple launching a new iPhone SE – it’s new, but it’s just smaller, and hardware and design are old hats. Personally, I find it a pity that the screen resolution is still “only” 1920 x 1080 pixels. That’s okay, but I would have thought Xiaomi would have a 2K display with so much closeness to Apple. This would probably have led to the lack of “Damn it I MUST have”. Well… maybe next year! To a certain extent Xiaomi is to blame for the fact that the Xiaomi Mi Notebook Air doesn’t get so much out of my socks anymore. For the third year in a row, the manufacturer is launching an absolutely well-rounded Xiaomi Mi Notebook Air 13.3″, which is state-of-the-art in terms of hardware and top-quality workmanship – we are apparently somewhat spoiled. If you are looking for a real alternative to MacBook with Windows operating system, which nobody else has at work or at university, the Xiaomi Mi Notebook Air 2018 with 13.3 inch is a good laptop, which is suitable for any complex office application and can also be used for gaming. Interesting is the price development of the Xiaomi Mi Notebook 2017, which should now be cheaper – at least a solid alternative!